William Shakespeare is a bit of a mystery. In fact, there is not much known about him for certain. However, there are registrar records, tax records, real estate records, court records, wills, marriage certificates, references to his works and to himself, and his tombstone, which can be gleaned for information. Much is assumed and speculated about him. However, in this essay, it is pertinent to explore only the facts we know for sure. He was born in the market town Stratford-upon-Avon in England as a commoner. However, his exact birthdate is not known, though most scholars believe he was born on the 23rd of April, 1564. We only have his baptismal record, which is dated as the 26th of April, 1564. He was the first son and first surviving child of John Shakespeare, a successful glover, and Mary Arden, the daughter of John’s landlord. In all, the couple had eight children, and at the time of William’s birth, the family had an above-average standing in terms of income, although the family would fall under hard times later (Potter, Lois). Though no records remain, it is thought that William went to the The King Edward VI School at Stratford for grammar school education, as it was very close to his home. In the Elizabethan Era, a royal decree was sent out that all children should receive intensive education in Latin grammar and literature. Therefore, it is assumed that William took part in this standard education. Though no records are shown of his education, his inventive language in his writing indicate that he had a formal education, and that this was coupled with living close to nature in his early years due to him living in the country (Honan, Park, and Bozkurt Bülent). The next sure detail in the famous playwright’s life was his marriage to Anne Hathaway, a daughter of a farmer, through a special license. Since he was 18 years old and she was 26, he required this document to be married in court. The license of marriage was given on the 27th of November, 1582. However, the exact date of his marriage is not known and the place where it was held is also not certain. This was a rare marriage in Elizabethan times, and now. But, it seems William was a rare person. Their first daughter, Susanna, was baptized on the 26th of May, 1583. Two years later, records show that the Shakespeares baptized a twin son and daughter, Hamnet and Judith, the 2nd of February, 1585. This was all before William was 21 years old (Schoone-Jongen, Terence G.). Subsequent to the record of his twins being baptized, for seven years, there is no historical trace of his doings—except for being a part of a lawsuit to recover part of his mother’s estate. Scholars refer to this time period as the “lost years.” However, what is certain is that during this time, he became well-known enough as a playwright that in 1592, Robert Greene, a popular English author, wrote jealousy about Williams being a part of the London theatrical scene and mocks him for his play Henry VI. Some evidence, however, has come forth that during these seven years, he was schoolmaster and playwriting on the side (Honigmann, Ernst Anselm Joachim). In late 1594, it is indicated that he was the part-owner of a playing company known as Lord Chamberlain’s Men, which was named after their sponsor. The group was well-known, it seems, as after the death Elizabeth I and the coronation of James I in 1603, the company was taken in by the monarch and renamed The King’s Men. At this time, also, William moved his family to the parish St. Helen’s, Bishopsgate, in 1596. In addition to being a famous playwright, he was a well-known actor as well, with him being on the featured list as an actor in 1598 for Every Man in His Humour by Ben Jonson and in the 1603 play Sejanus: His Fall, also by Jonson. By 1598, his name began to be printed on the title page of his plays for unidentified reasons, though scholars think it was because he thought he would sell more tickets through the popularity of his name. As a side note, he also acted in many of his own plays, such as being the ghost of Hamlet’s father in the Tragedy of Hamlet (Ackroyd, Peter). In regard to all the evidence, Shakespeare wrote at least 37 plays, and collaborated on several more, from 1590 until 1613 (The British Library). 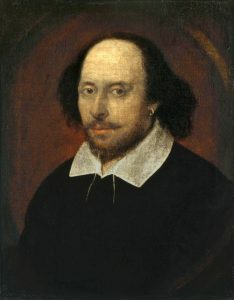 His earliest known play is Taming of the Shrew, written before 1592, and his latest play was The Two Noble Kinsmen, told to be written during 1613-1614 (“Timeline of Shakespeare’s Plays”). Not only did his company become royally-appointed and popular, but he also became successful enough to branch out into the real estate business and even a seller of grain (Boehrer, Bruce Thomas). So, he combined his successes with his plays with his business ventures to create a powerful local persona and a great standing in the community—despite being officially a commoner. His death came early, at the age of 52, on April 23rd, 1616. It was on the same day that he is speculated to be born. He died about a month after signing his will, and writing that he was in fine health in the document. No reliable source tells how he died, though about 50 years after Shakespeare’s death, John Ward, the vicar of Stratford, wrote this entry in his notebook: “Shakespeare, Drayton and Ben Jonson had a merry meeting and, it seems, drank too hard, for Shakespeare died of a fever there contracted” (Schoenbaum, S.). Though not much is certain about the most famous playwright in history, countless biographies have been written about him. The mystery of Shakespeare adds much to his historical appeal, but his plays have stood the test of time, with him being celebrated as the standard for playwriting until this day. Born as a commoner and living as a country boy, his supposed love for writing and literature at an early age propelled him to write plays and to act in them as well. No one is sure how he became well-known as a playwright, but the first official mention of him in history in terms of his playwriting was a fellow writer composing a piece about him in jealousy of his fame. With the earliest play of his being the Taming of the Shrew, Shakespeare went on to write at least 37 plays in his lifetime, with him collaborating and acting in several other productions as well. He is also known for his poetry, and the Shakespearean sonnet obviously has his namesake. Besides writing, he also became a businessman as a real estate and grain seller. He seemed to be a versatile person who could combine creativity with business. But ultimately, he is remembered for his plays, which are still being shown across the world every day in many different forms. Potter, Lois. The Life of William Shakespeare: a Critical Biography. Wiley-Blackwell, 2012. Honan, Park, and Bozkurt Bülent. Shakespeare: Bir yaşam:yaşamöyküsü. Yapı Kredi Yayınları, 2001. Schoone-Jongen, Terence G. Shakespeare’s Companies William Shakespeare’s Early Career and the Acting Companies, 1577-1594. Taylor and Francis, 2016. Honigmann, Ernst Anselm Joachim. Shakespeare: the Lost Years. Vintage, 1996. Ackroyd, Peter. Shakespeare: The Biography. Vintage Books, 2006. “William Shakespeare.” The British Library, The British Library, 13 Jan. 2016, www.bl.uk/people/william-shakespeare. Boehrer, Bruce Thomas. Environmental Degradation in Jacobean Drama. Cambridge University Press, 2015. “Timeline of Shakespeare’s Plays.” Royal Shakespeare Company, www.rsc.org.uk/shakespeares-plays/timeline. Schoenbaum, S. Shakespeare’s Lives. Barnes & Noble, 2006.